This map of Saturn's F ring illustrates how the ghostly strands flanking the core of this contorted ring, when examined in detail, actually form a spiral structure wound like a spring around the planet. 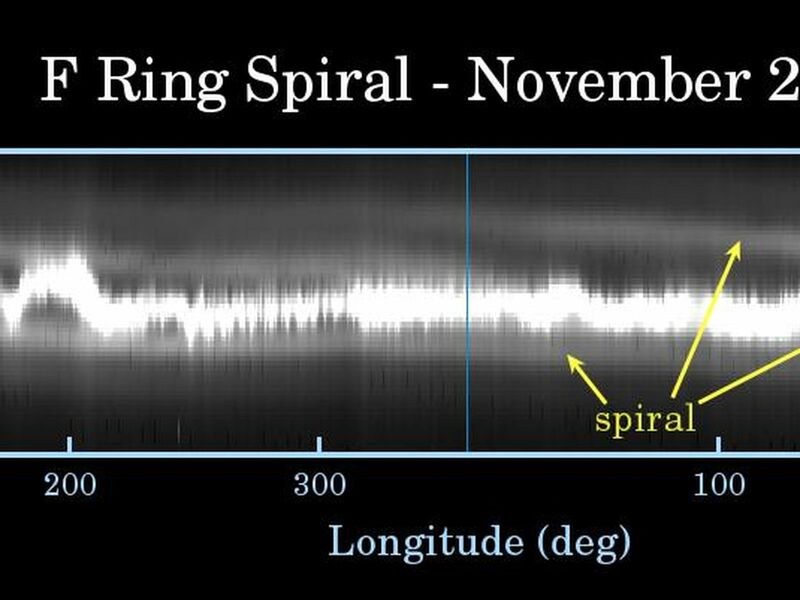 Two identical maps of the F ring have been joined, side-by-side, to show the nature of the spiral more clearly. The F ring has been mapped as if it were a circular feature, so that its eccentricity is not apparent here. The spiral strand's path across the image begins about 350 kilometers (217 miles) inward of the F ring core at about 200 degrees longitude (bottom axis) on the right map, and moves closer to the ring core toward the left, wrapping over onto the map on the left. The strand appears to cross the ring core around 100 degrees longitude, after which the distance between the strand and the ring core increases to the left and can be followed, moving even farther outward, wrapping around to the rightmost boundary of the right-hand map and continuing to the left. Other spiraling structures seen in the main rings of Saturn, the density and bending waves, are initiated by the gravitational influence of an orbiting moon. Density and bending waves move across the rings because of the way that relatively massive ring particles exert a gravitational influence on each other and can all move together. 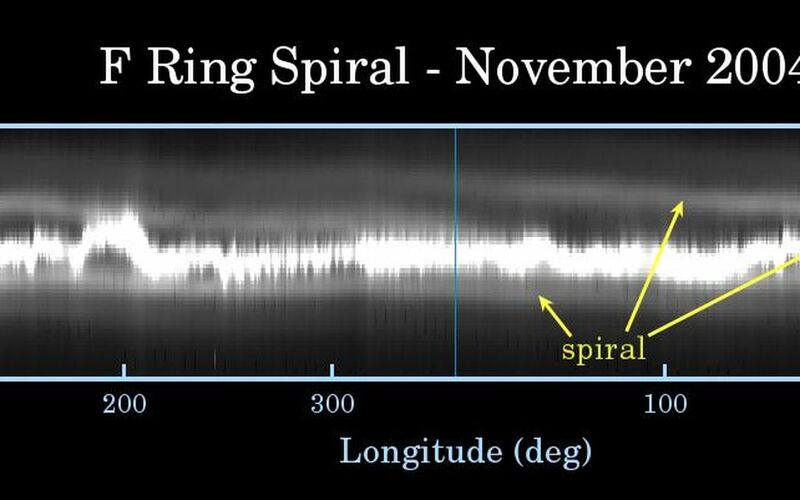 In contrast, the F ring spiral structure contains very little mass and appears to originate from material somehow episodically ejected from the core of the F ring and then sheared out due to the different orbital speeds followed by the constituent particles. 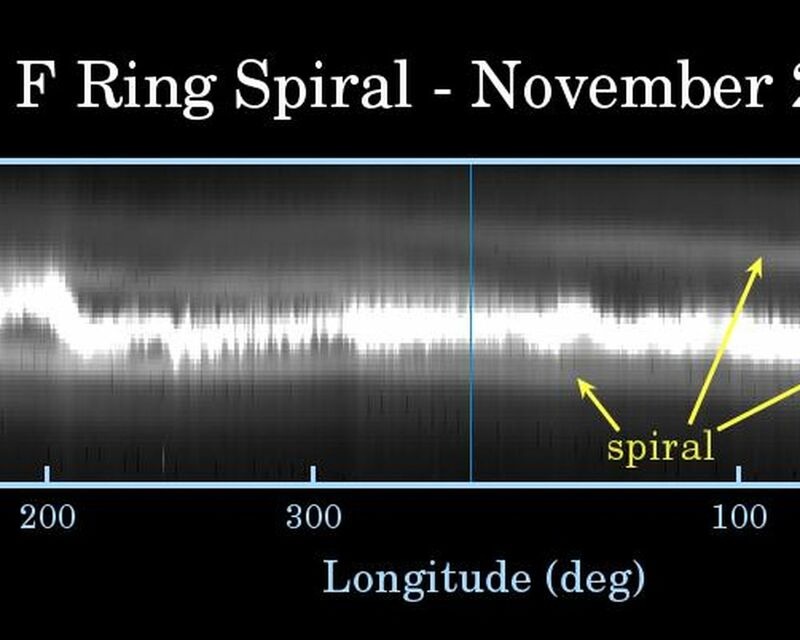 Scientists have speculated that the spiral may be a consequence of moons crossing the F ring and spreading its particles around.